Some roads into higher education are longer than others, but the commitment to pursue a Lafayette College degree seems somehow more significant when the adventure begins more than 5,000 miles away in Lagos, Nigeria. That’s where Aaliyah Shodeinde ’17 started her undergraduate journey four years ago. Leaving home was the easy part; facing profound cultural differences proved more challenging. 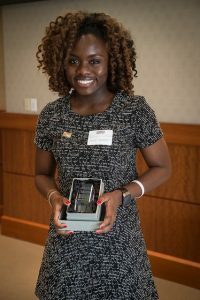 She eventually overcame those obstacles and received the 2017 Dr. Eugene DeLoatch ’59 Excellence in Science and Engineering Award given each year by the McDonogh Network to a senior with outstanding academic accomplishments. When she first arrived on campus, Shodeinde wanted to be a chemical engineer, hence the major in chemical/biomolecular engineering and minor in biotechnology. Her homeland, after all, draws its greatest income from petroleum, oil, and gas. It only made sense that she’d get a job at Exxon or some other multinational oil and gas corporation. It wasn’t long before she knew her decision to study at Lafayette was the right one, but she questioned her choice of majors. She shared those doubts after her first semester with adviser Lauren Anderson, who invited Shodeinde into her biotech lab. Anderson, associate professor and department head of chemical and biomolecular engineering, explained that blood flow and bodily functions also could apply to chemical engineering. “I read Dr. Anderson’s papers and shadowed her for two semesters. Her interest is drug delivery, and it grabbed me,” says Shodeinde, who decided to keep her major but shift its focus. Another Lafayette mentor, Christopher Anderson, assistant professor of chemical and biomolecular engineering, introduced Shodeinde to silver nanoparticles. Shodeinde’s long-term goal now is to work for a pharmaceutical company. Her undergraduate research exposed her to variations in drug delivery and what nanoparticles do to cancer cells. Exciting research opportunities were also the deciding factor in her decision to attend a five-year doctoral program at University of Texas at Austin. The wins and challenges of the past four years have allowed her to embrace the truth that her voice and perspective are valued and valuable. And she believes in paying forward kindnesses shown her.